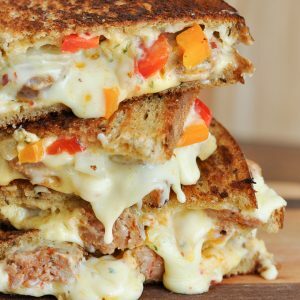 Sausage and Pepper Chipotle Grilled Cheese: tasty sausage and peppers packed into the cheesiest, meltiest grilled cheese ever! Once you stop snickering, cook them any way you choose! I typically boil them for several minutes so they're cooked enough to slice, then saute the slices along with my peppers and onion. All the flavors mingle and some serious magic happens in that pan! Grate your cheeses and season with a few sprinkles of parsley, if desired. Next heat a pan with half the butter on medium-high heat, add your bread and a small pile of grated cheese and top with a slice of deli cheese. Since melted cheese does a stand-up job of holding together a sandwich, I add cheese to the bread, then pile on the sausage, peppers and onion, then top it with even more grated and sliced cheese. Just pack it all in. You'll thank me later when you're face-first in ooey gooey amazingness. Use a spatula to flip the grilled cheese, adding the rest of the butter to the pan to coat the virgin bread. I've also seen friends simply heavily butter both slices of bread before proceeding and it works just as well. Whatever your method of choice, just go with it! No chipotle cheddar? No problem! Mix a little of the adobo sauce from a can of chipotle chiles into your cheese. Start with a little and add extra to taste for a smokey kick to your grilled cheese sammie!